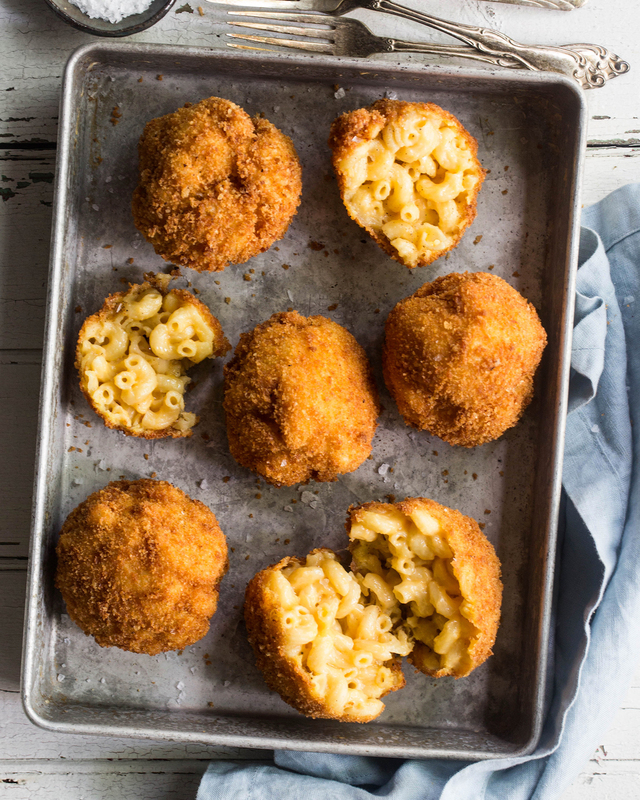 Today I am making Deep Fried Mac & Cheese Balls! Yeah, you read that right! I am taking delicious mac and cheese, forming it into a ball, and deep frying it. It combines everything I love about mac and cheese and everything I love about fried food, all in one heavenly package. To fry these balls to perfection I am partnering with Chefman, using the Chefman Deep Frier! It takes all the guesswork out of frying with it’s easy to use temperature controls. Watch step by step how to make them in my YouTube video below! Bring a large pot of salted water to a boil over high heat. Add the macaroni and cook until al dente, about a minute less than the recommended cooking time on the package. Add in the cheddar cheese, salt, pepper, and mix until combined. Add in the drained macaroni into the cheese mixture and mix until combined. Pour into a large 9x13 inch baking pan, cover, place in the fridge for at least 3 hours to overnight. Shape the cold mac and cheese into tightly packed meatball-sized balls and place them onto a parchment paper-lined tray. Place in the fridge for 20 minutes. In a small bowl combine the breadcrumbs and parmesan cheese. In another small bowl beat an egg until fully combined. Coat each of the balls of macaroni in the egg followed by the breadcrumbs. Place back on the tray and repeat with the rest of the balls. Meanwhile preheat oil in the Chefman Deep Fryer to 350 degrees Fahrenheit. Fry each ball for 5 minutes until golden brown.